We are pleased to bring you the first of what we hope to be a regular series here on Phoresia – the emerging shaper interviews. The shaping world was rocked by the closing of Clark Foam. Since then many things have conspired to drive the craft of hand-shaped surfboards down the way of the dinosaur. But good things are hard to fully displace and even today, at a time when pop-outs are being liquidated at below wholesale prices, a good shaper can still make a living. For the surfer who chooses to work directly with a shaper in sourcing new boards, a relationship is established which can often last a lifetime. In some ways getting a custom surfboard hearkens back to a simpler time in our society where each community had it’s furniture maker, a tailor, a baker, a blacksmith. People worked with their hands to create the tools for daily life. Industrialization and consumerism have vanquished much of the old ways of life and surfboard shapers are an important root to keep us grounded not only in tradition but also in self reliance and community. We met Josh Hall while we were in NYC for the surf film festival. Josh is friendly and unasumming. The boards in Mollusk bearing his JH logo were nothing short of artworks. Josh’s shaping lineage helps to ensure his customers that his designs are not some random after-thought, but rather well researched and refined wave riding craft. Josh took the time to do a short interview with us for your reading pleasure. If you’ve never ordered a custom surfboard then your missing out on a beautiful aspect of surfing. Give Josh or your local shaper a call. Can you yell us your name, where you live/shape/surf? Hello my name is Josh Hall. I’m lucky to have been born and raised in San Diego California. I currently live in Pacific Beach which is where I grew up going to the beach and I currently surf most of the breaks between Blacks and Sunset Cliffs. Of course it all depends on tide, wind and swell direction. I actually just hit my 10 year mark. I shaped my first board my first semester freshman year of college and would do maybe one or two a month up until I decided to make surfboards my life about two and a half years ago -going full time in January of 2007. I’m really blessed and fortunate to have been taken under the wing (no pun intended) of Skip and Donna Frye. I was the last adopted grom of Harry’s Surfshop which used to be located on Felspar St. just north of Crystal Pier in Pacific Beach -the exact street where I grew up surfing. Having Skip’s influence on me has been the biggest blessing ever. I mean I can’t really sum it up in a little paragraph. He basically taught me everything I know about surfing, shaping, design, the weather, life, everything! He taught me how to ride all sizes and shapes of boards and kept me always messing with fins; his influence on me is immeasurable. I feel I have a responsibility to carry on a real specific design thread that is totally unique to South County San Diego. I want to share the experience of surfing I had growing up with others by building boards of Skip’s style and tradition. Of course with my own spices in the mix. I have to add this in here also. I grew up watching Joel Tudor surf, whether in movies or in person. Not only did his style have a big impression on me, but his did equipment as well. Many of the types of boards I build come directly from Joel’s surfing and the shapers he was working with, Donald Takayama and Stu Kenson. 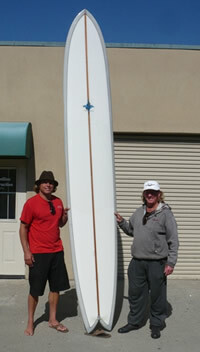 In fact, Stu built me a few custom boards prior to me hooking up with Skip and one of them was a 9’4 Tudor-esque single fin pintail. How’s that for a small world story! So today, I kind of have a dichotomy in my portfolio as to what I can offer each surfer depending on what they want and where they surf. Do you have a specific design that you prefer or excel at like thrusters, hi volume shortboards, logs, etc.? Well due to the huge presence of the fish design in the market, and being as where I’m from and who I learned to shape from, I build a lot of fish in all lengths from 4’10 to 12 feet -and more quads than keels. On the other side, I love traditional style logging so along with the help from my team, we’ve come up with numerous takes on traditional logs. 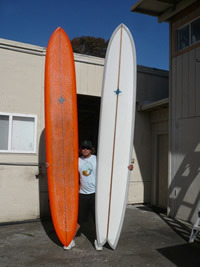 I’ve also built some hulls, lots of eggs, and even a couple of pretty high performance style small boards. I ride all the boards I build until they become too small for me to ride. Do you or have you used alternative materials such as Biofoam, wood or EPS? Not really. I have shaped two balsa fish thus far, but haven’t really used any of the alternative materials out there. Not because I don’t want too, just the opportunity hasn’t really come around for me yet. I think part of that also is that for some of the materials you need to change how you shape, and not that I’m old and set in my ways at all, but I do know what feels more comfortable to me. Also, due to where my boards are placed in the market, I need to be really consistent with quality and some of the alternatives have their issues throughout the production process that could create problems. The other thing too though is that at the end of the day, in my opinion (for what its worth), it still seems that the poly/ fiberglass combo still has the best performance characteristics for surfboards. I do think though that there needs to be more effort put into to how we can recycle the foam dust that is produced -I think we could use it for something, like I dunno, wall insulation? Something. Well, right now I think if you ask most people they’d say it’s not looking good. But I feel the opposite way. I agree that it is getting smaller -less people doing it, but the flip side is that more people are becoming aware of it(handcrafted boards) and appreciating them. So I think its moving in the right direction. I mean, the current state of the economy and such is pretty scary, but hey, we are surfers and we’ll skip rent or ride a bike but we’ll for sure have the sweetest quiver. Hahaha. One more thing I’m noticing it that the younger kids aren’t waking up everyday dreaming to be Slater or AI (Andy Irons). They’re tuning in to the boards that are gonna be most fun and catch the most waves. So I think that will help all of us new and/or young guys down the line. Well I’m still so new and young in this game but fortunately the boards have received really positive feedback so I hope things will grow. I’m so lucky to be where I’m at and with whom I’ve been able to learn from that I feel the boards offer something different in the market and for the surfer. So I hope people will tune in and pick one up…for many years to come! In short, I get to play Santa Claus everyday. There is nothing more satisfying than when a client calls you after their first surf and just goes off about how awesome the board worked and such! I mean, think about it. I build something that brings so much pleasure to someone in their life, maybe its making the world a happier place? Maybe? But, only until they start catching too many waves at their local break! hahahahaha. Hey Chuck thanks for the comment and trust me we are on the same page. In fact we have an interview on the way with a rad shaper from NYC. But hey if you have some guys in your area that you think would be good candidates (new ideas, quality craftsmanship, etc.) then please drop us a note with some contact info.